Core Tool Battery + Charger Not Included, our basic best, Whether you've already bought the battery or are simply look to expand your iON arsenal, the Snow Joe iON13SS 40V 13-inch Snow Shovel is the Core Tool for you, if you only want the basic tool without all the extras, this stripped-down version makes an ideal addition to your trove of yard and garden tools. Battery and charger sold separately. Perfect for quick, easy and CORD-FREE snow pickups on decks, steps, patios and sidewalks, the iON13SS Core Tool combines innovation and functionality to blast through 300 lbs. of snow per minute. Equipped with a heavy duty, 2-blade paddle auger, and the iON13SS Core Tool throws snow up to 25 ft., clearing a path 13-inch wide by 6-inch deep with each pass. A durable scraper bar at the base of the unit lets you clear right to the ground without damaging your deck or pavement. Packed with user-friendly features, the Snow Joe iON13SS Core Tool starts instantly with the push of a button and its patented back-saving handle maximizes operator comfort. Lightweight and compact, it's easy to tote onto your deck or steps, or carry to the hall closet for convenient on-the-go access. This winter, Go with Joe: The Snow Joe iON13SS Core Tool. Get Equipped. The Snow Joe iON13SS Core Tool is compatible with EcoSharp 40V 4.0 Ah and EcoSharp 40V 5.0 Ah batteries - sold separately - for up to 65 minutes of whisper-quiet runtime. ETL approved; Full 2-year warranty. This INFINITY snow scoop shovel has a robust 19 inch black blade, a red steel shaft, and a comfortable d-grip handle. Shoveling walkways, driveways, and stairs can be completed quickly and efficiently using this lightweight shovel. It is robust and suitable for professional use. Enjoy this great Canadian made shovel for many years. 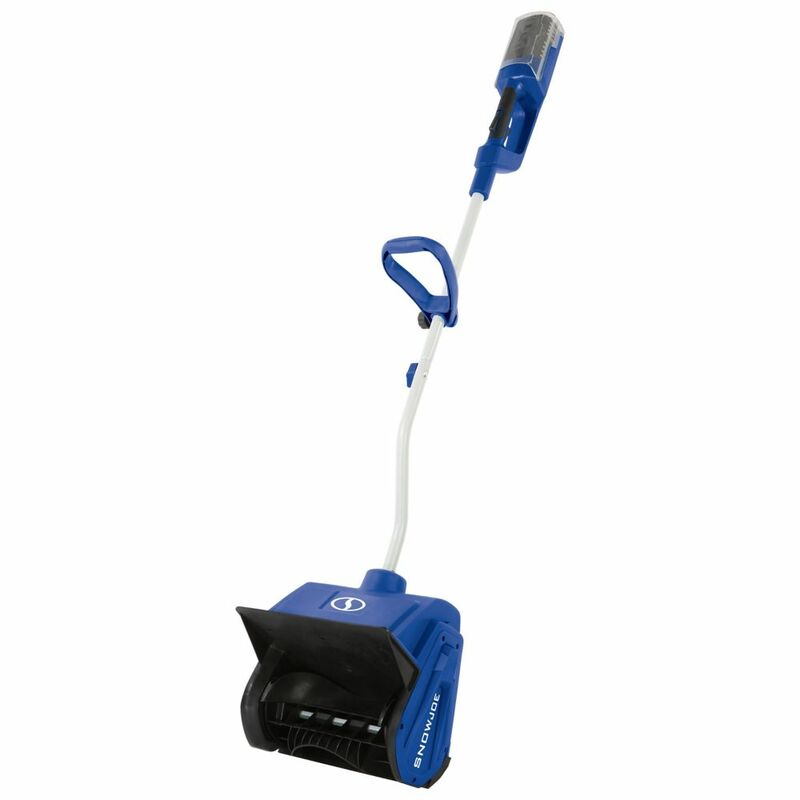 Treat yourself to the Garant all-purpose snow pusher to push light snow away from large areas. An ideal product for clearing snow from your asphalt or paving stone driveway. For occasional use. This snowpusher is designed for those who want a product with an excellent quality/price ratio. iON Core Tool 40V Cordless 13-inch Brushless Electric Snow Shovel (Tool Only) Core Tool Battery + Charger Not Included, our basic best, Whether you've already bought the battery or are simply look to expand your iON arsenal, the Snow Joe iON13SS 40V 13-inch Snow Shovel is the Core Tool for you, if you only want the basic tool without all the extras, this stripped-down version makes an ideal addition to your trove of yard and garden tools. Battery and charger sold separately. Perfect for quick, easy and CORD-FREE snow pickups on decks, steps, patios and sidewalks, the iON13SS Core Tool combines innovation and functionality to blast through 300 lbs. of snow per minute. Equipped with a heavy duty, 2-blade paddle auger, and the iON13SS Core Tool throws snow up to 25 ft., clearing a path 13-inch wide by 6-inch deep with each pass. A durable scraper bar at the base of the unit lets you clear right to the ground without damaging your deck or pavement. Packed with user-friendly features, the Snow Joe iON13SS Core Tool starts instantly with the push of a button and its patented back-saving handle maximizes operator comfort. Lightweight and compact, it's easy to tote onto your deck or steps, or carry to the hall closet for convenient on-the-go access. This winter, Go with Joe: The Snow Joe iON13SS Core Tool. Get Equipped. The Snow Joe iON13SS Core Tool is compatible with EcoSharp 40V 4.0 Ah and EcoSharp 40V 5.0 Ah batteries - sold separately - for up to 65 minutes of whisper-quiet runtime. ETL approved; Full 2-year warranty. iON Core Tool 40V Cordless 13-inch Brushless Electric Snow Shovel (Tool Only) is rated 3.9 out of 5 by 101. Rated 1 out of 5 by Jim from Used it a few times during the winter. Had it stored in basement with attery attached and it ca... Used it a few times during the winter. Had it stored in basement with attery attached and it caught fire. Luck smoke detectors went off. Seem lithium battery went bad and melted the battery and shovel housing. Rated 4 out of 5 by happy grandma from Performs as promised I am an older woman who can still use a push shovel, but when the snow got so deep I had to “throw” it I gave up and bought the Snow Joe. Should have had it from the start! The product is a little heavy to lift or carry for me, but pushing it around on my front and back patio isn’t much different than vacuuming. Very easy to use. The product will move a lot - a whole lot - of snow, however if you get a big storm that dumps a foot or so at once it will become more difficult to use as you need to hold the shovel up for the first pass. It will still do the job, it’s just harder work. It’s also important to note that you can’t “direct” the snow, so wind direction is important to avoid getting a face full of snow. My patio and deck are open so I can push in any direction, depending on wind, but in a confined area where you can only push one way this could be a problem. I’m loving mine! Rated 5 out of 5 by LoveMyJoes from I already owned the SnowJoe 40V snow blower and lawn mower, which I really like. I bought the sn... I already owned the SnowJoe 40V snow blower and lawn mower, which I really like. I bought the snow shovel primarily for another smaller property - it fits into my sedan, which the snow blower does not. It does a fine job, with the limitation of not being able to direct the snow anywhere other than straight ahead. But a couple of weeks ago it proved more valuable in another way. The snow plows came through town a couple of days after the storm and created a cliff of snow plow junk about 15" high at the end of my driveway. This in zero degree weather so that junk was frozen solid. It took a couple of passes due to the depth but this shovel positively at that stuff up. Rated 4 out of 5 by PamS from Snow removal tool for older women. This is an excellent tool for clearing sidewalks, especially for senior citizens. I am 74 y.o. and shoveling snow was becoming very difficult. The Snow Joe is easy to use, works well, and compared to a regular shovel, is almost effortless. Rated 5 out of 5 by Olney User from Terrific product! I received a Snow Joe from my son and his wife in December and have really loved using it. I have a fairly large driveway and a short sidewalk to clear. The Snow Joe has cut my work time in half and minimized back strain. I was also quite pleased to finish both the driveway and the walk without having to recharge the battery. Rated 4 out of 5 by Mighty from I got to use my Snow Joe for the first time last weekend and it was great. I love shoveling snow and the Snow Joe made it easier in less time. It usually takes me a couple of hours to shovel but with the Snow Joe I was done in less than an hour. Rated 5 out of 5 by Casey777 from What a powerhouse! I love this thing! It really does the job. I am able to clear my deck, sidewalk, front and back walkways in no time at all. Better yet, it is almost effortless, and takes the snow all the way down to the surface. It isn’t heavy, so it’s easy for me to go from frontyard to backyard, carrying it right through the house. The battery charge lasts and lasts. I have yet to run low. I was worried that it might not handle deeper snow, but it handles it in one clip. As an added bonus, I think it’s fun. no more sore back for me! What a great machine! I didn't see any info on this listing to link to the kind of battery /charger it takes. I want to know which of the numerous batteries listed separately would be the one to use for this Snow Joe shovel.